Khyber District (Pashto: خېبر ولسوالۍ‎, Urdu: ضِلع خېبر‎) is a district in Peshawar Division of Khyber Pakhtunkhwa province in Pakistan. Until 2018, it was an agency of Federally Administered Tribal Areas, with merger of FATA with Khyber Pakhtunkhwa, it became a district. It ranges from the Tirah valley down to Peshawar. It borders Nangarhar Province to the west, Orakzai District to the south, Kurram District to south west, Peshawar to the east and Mohmand District in north. Khyber District is currently subdivided into four tehsils. Portions of Khyber Agency are verdant. Khyber Pass is a major feature of the Khyber Agency. Its narrowest point is Ali Masjid, where the Battle of Ali Masjid occurred. The Khyber Rifles paramilitary organization originated in the area and took their name from it. A Khyber Pass Copy is a homemade firearm characteristic of the Khyber area. Both the Khyber Mail Train[dubious – discuss] and the Khyber Train Safari routes passed through the Khyber Agency via the Khyber Pass. Khyber Agency is the most literate of all the Tribal Areas, with a literacy rate of 34.2%, as of 2007. Quite far ahead of the next highest Agency - Kurram at 26.5%. It is also the only Agency where the majority of its men are literate, at 57.2%, which is almost 20% ahead of the next highest agency, Kurram. However, its Female literacy rate of 10.1% is 2nd after Kurram's 14.4%. The majority of the tribes in Khyber Agency are Afridis. However, there are important pockets of Mullagoris, Shilmanis, Bangashs and Shinwaries. Tehrik-i-Taliban Pakistan, Lashkar-e-Islam and Tehreek-e-Nafaz-e-Shariat-e-Mohammadi militants began entering Khyber Agency after the US-led NATO Invasion of Afghanistan in 2001. Due to absence of a strong government and security network in the area and its rough, mountainous terrain, the area became a hotbed of the insurgents and over 90 percent of the agency came under their control in 2007. After 2007, the militants began attacking government and military establishments in KPK province killing many people and wounding many more. The Pakistan Army began an operation in 2008 to clear the agency of militants and restore normal life in the area. The Operation continued for years and resulted in killing of hundreds of TTP militants and Pakistan Army soldiers. The Local Aman Lashkars or Peace committees supported the army by fighting the foreign terrorists. By July 2012, a major part of the agency was cleared but military operation continued in Bara Tehsil of the agency. The Operation also Produced a large number of internally displaced people. In October 2014, Pakistan Armed Forces launched a military offensive in Khyber Agency code-named Operation Khyber-1. 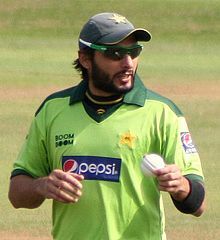 Shahid Afridi in the field during a cricket match. People belonging to this area enjoy cricket, famous Pakistani cricketer Shahid Afridi is from to this area. ^ a b 1998 Census report of Khyber Agency. Census publication. 138. Islamabad: Population Census Organization, Statistics Division, Government of Pakistan. 2000. ^ a b "DISTRICT AND TEHSIL LEVEL POPULATION SUMMARY WITH REGION BREAKUP [PDF]" (PDF). www.pbscensus.gov.pk. 2018-01-03. Retrieved 2018-03-25. ^ Dawn. "South Waziristan operation: Only Sararogha cleared in three years". ^ Shahid Afridi | Pakistan Cricket | Cricket Players and Officials. ESPN Cricinfo. Retrieved on 2013-07-12. Wikimedia Commons has media related to Khyber Agency.